Will Twin Peaks TV show be cancelled or renewed for season four on Showtime? Deadline reports Showtime president and CEO David Nevins said, “It was always intended to be one season. A lot of people are speculating but there’s been zero contemplation, zero discussions other than fans asking me about it.” According to the report, Nevins made the remarks during Showtimes TCA summer press tour party. A Showtime supernatural drama, Twin Peaks is a continuation of the original 1990s ABC TV series. 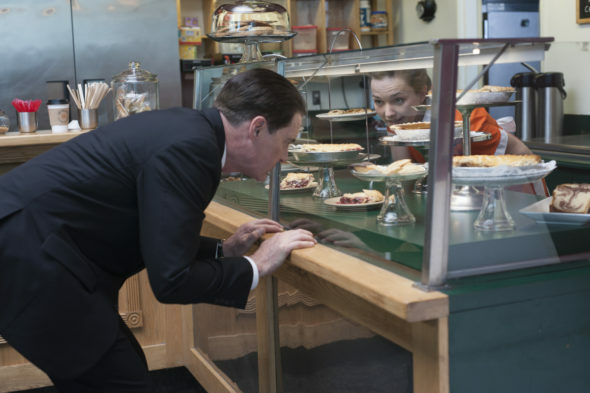 Also known as Twin Peaks: The Return, the horror mystery centers on FBI Special Agent Dale Cooper (Kyle MacLachlan). The cast also includes Mädchen Amick, Dana Ashbrook, Everett McGill, Kimmy Robertson, Russ Tamblyn, Ray Wise, Grace Zabriskie, Amy Shiels, Robert Forster, Phoebe Augustine, Chrysta Bell, Richard Beymer, Catherine E. Coulson, Jan D’Arcy, Laura Dern, David Duchovny, Sherilyn Fenn, Miguel Ferrer, Eddie Vedder, Naomi Watts, and Alicia Witt. In the third season of Twin Peaks the initial airings are averaging a 0.10 rating in the 18-49 demographic and 294,000 viewers. Compared to other Showtime TV shows, it currently ranks 10th or 11th, depending on how we sort the numbers. What do you think? Have you been watching the Twin Peaks TV series revival. Is it ending at the right time? Would you have watched a fourth season, had it been renewed? Let us know, below. More about: Showtime TV shows: canceled or renewed?, Twin Peaks, Twin Peaks (2017), Twin Peaks (2017): canceled or renewed?, Twin Peaks (2017): ratings, Twin Peaks: canceled or renewed? Best show ever, wish there could be more. Lynch is a legend, whole cast is brilliant, so sad some are no longer with us. Best show ever. Lynch is brilliant, whole show is an absolute treat. Wish there could be more. Yes bring on more…More!! Fantastic thank you to everyone involved!! The only reason I subscribed to Showtime was Twin Peaks The Return. If they dont bring back another season 4 I will cancel my service. If the show returns, it should, and probably would, be without the 200 or so odd cameos of “big name stars” most true Peak fans never really cared about. It would tighten up the story, allow more room for story development, and it wouldn’t need 18 episodes. A 13 or 14 episode season would suffice. Come on, was Richard Chamberlain’s contribution worth reducing the salaries or screen times of traditional Peaks actors? No. I don’t blame Michael J. Anderson for being miffed about that. He’s offered a pittance so some Hollywood power player can call in a favor? Outrageous.